to write the serial number of a one dollar bill on the back-of "that card. Do so. You write the number which is on the bills in the Para—Mental. Put' the business card in the blank envelope and clip it to the stand. Next borrow from three different people three one dollar bills. .Tell each spectator to fold his bill in half and then in half again, so the serial number is on the inside of the bill. Make sure the bills hidden in the Para-Mental are folded the same way. Give each spectator one of the numbered envelopes and have them put the bills in the envelopes. Clip the envelopes to the stand. Have the spectator who loaned you the business card think of one of the numbered envelopes. Tell the audience you have predicted the number on a bill and not only wrote the number of a bill on the card before you borrowed the bills, but also have not seen or touched the borrowed bills. Also mention that the spectator who is thinking of one of the numbered envelopes is going to choose that numbered envelope which contains the bill that you have predicted. Have the spectator call out the number of the envelope he wants. Remove the other two envelopes with numbers by pulling DOWN on the envelopes as you do with the cards in the other routine. Remove the clips and let the spectator remove the bills and call out the numbers on them. Then remove the blank envelope and hand it to the spectator who loaned you the business card. Ask him to remove the card it contains as you remove the last envelope from the stand. These last two envelopes are removed from the stand by PUSHING UP on them. Remove the bill from your envelope (actually you are bringing the bill up from the back). Crumple the envelope and drop it on your table. Hand the bill you supposedly removed from the blank envelope to another spectator and have him read off the numbers or do it yourself. Have the spectator with the business card which contains your prediction verify each number as it is called out. If you want the routine to last longer, borrow four bills, use four envelopes, put numbers on them, from one to four and go through the same routine as above, only instead of clipping your prediction to the stand, let a spectator hold it. Naturally, you will also need four bills hidden in the stand. When using either routine of the three cards or the three bills, remove the wax from the one clip which holds your blank envelope. Then when you push up on your envelope, you can hand it to the spectator with the clip on it and have him remove the clip first ar.d then the card (or bill) , and the clip will not stick to the envelope as he removes it. Effect #1: A-freely selected .card is" placed- on-top -of deck in full view. 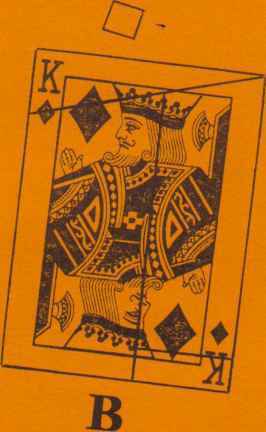 Performer reTrccves a wallet from his jacket pocket, opens it, removes a small pay envelope from it, and it is seen to contain the same card as the card selected by the spectator, and placed upon top of the deck, with a differently colored back. Preparation: Place a card in pay envelope and place pay envelope in inside left portion of wallet. Place a duplicate card (which is of a contrasting colored back), face down on top of the face down deck. On this put a specially gimmicked card, which is loaded with a steel plate and therefore can be picked up with a magnet. Wallet is placed in breast pocket of jacket, with several papers or bills, etc. within it to make it look absolutely innocent. First, casually fan deck face up, showing all cards different (you may even shuffle them as long as the top two are left intact). Fan deck face down,- have, spectator touch any card. Tell him he can change his mind if he wishes (and he can!) Pull card forward. Say: "So you can remember your card we'll place it on top of the deck" and so do. Remove wallet from coat pocket, open it and remove papers from it. As y"u say "If you want to initial your card, you may do so" let side of wallet rest on top of dec-as you remove pencil from wallet and hand pencil to spectator. Pull wallet to left of deck. Concealed magnet in wallet will lift gimmicked card and selected card away, leaving the card on top which matches the card in pay envelope with contrasting colored back. You now remove pay envelope and disclose cards, one red back card and one blue back card, both of the same suit and value. Thought has been controlled! As you take the wallet away, keep both sides hanging down from its center; this will effectively hide the stolen cards. Then casually put wallet in left side coat pocket. Effect #2: Blank cards may be inscribed with various designs, similar to E.S.P. designs. Draw figure on second flap of index at left of wallet. Place duplicate design on top pile of cards, face down and gimmicked card face down above that:. Proceed as in Effect ?? 1. Many other effects are possible with this fine utility item. Once in a lifetime a trick is conceived which embodies all of the features that make a magic trick successful. This, we feel, is it! Through the courtesy and cooperation of the Mercury Mystery Magazine, Ellery Oueen and Fred Dannay (all connected with Mercury Mystery Magazine) we were able to print a magazine that will send the average mentalist into ecstati raptures. With this magazine you can make a prediction a week or so in advance and then read a"spectator's mind the night you perform on television, radio or the stage. First, let us describe the effect: Three magazines are shown, such as Reader's Digest, Coronet and the Ellery Queen Mystery magazine. The spectator chooses one, turns to any page and the story he turns to is discerned by the mentalist, also the author, several words chosen and revealed and then a startling prediction is made. Placed in a crystal box a week or so ago is found the very word chosen by the spectator a week later. You may even offer a thousand dollar challenge that you will reveal the very word the spectator will choose from a hundred thousand words in a magazine.